What Is Wrong with CNN? Secretary Robert Gates sounding the alarm about the Iraq mission. He is predicting very serious consequences for US forces, in just a matter of days if a new cash infusion doesn't come through. CNN Pentagon correspondent Barbara Starr has more. Barbara, of course when we hear the President sound those alarms, his critics question his reliability, but now you are getting this from the Pentagon, tonight. "Suzanne, Defense Secretary Robert Gates had a very dire prediction today. If there isn't an agreement with Congress for additional war finds, maybe the war would have to end." 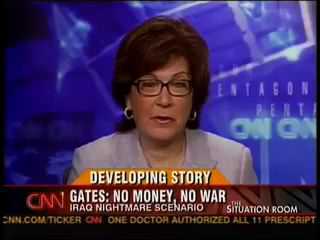 As you can see from the picture above, the caption read "Gates: No Money, No War, Iraq Nightmare Scenario." So, after we hear that somewhere between 2/3 and 3/4 of the American people want an end to the war, and the administration repeatedly asserting that Congress's only role in war is the "power of the purse", we now learn from CNN that "the war would have to end" constitutes a "nightmare scenario", a "dire prediction" of "serious consequences". What is the world coming to? In this democratic Republic, the populace might get what they want! Shameful. OK, now that I've used sarcasm, maybe I'm not giving them enough credit. Maybe CNN was doing the same thing. Maybe I just missed it. Maybe all that's wrong with CNN is that they think I'll recognize sarcasm. Maybe I can't. Maybe their delivery stinks. I don't know. But my jaw certainly dropped. It certainly doesn't sound like that legendary "Liberal bias" one hears the non-Fox News mainstream media accused of. Note that the two journalists quoted above are the show's anchor and their Pentagon correspondent, and not partisan commentators, and yet Barbara cites the "very dire prediction... maybe the war would have to end." There's no indication at all that there is any contrary view, that ending the war might not be a "nightmare scenario". As ever, don't believe me. You decide. Watch the video on YouTube, read the transcript. Judge or yourself. Cry Freedom! Be the Voice of Liberty!